Click image to view brochure. It’s a known fact that hospitals are noisy. It’s also known that despite significant effort toward hospital noise reduction, they’re not getting any quieter. Now hospital noise monitoring and hospital noise reduction are simple, accomplished with Soniu's Sound Monitoring Program. Sonicu combines patented Sound Indicating Meters a cloud-based software program and state-of-the-art, proprietary reporting capability to help you manage the sound environment. 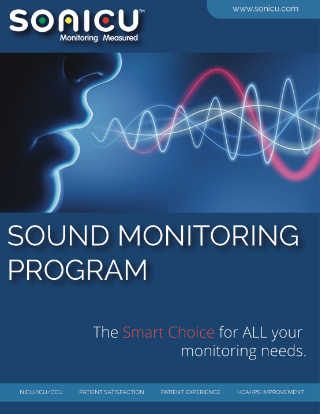 Download our free Sound Monitoring Program brochure to discover how one wireless monitoring platform provides remote sound monitoring, 24/7/365 protection and alarming and advanced reporting for your enterprise.